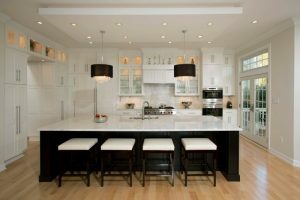 Greek style has a very distinctive look. 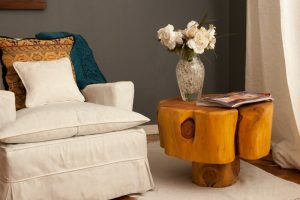 It combines natural forces to create an amazing ambiance. It also shows the natural color in many shades without adding any bold color. 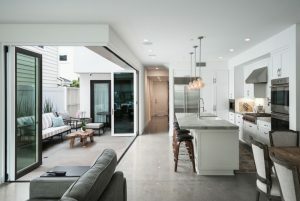 It embraces natural light and fresh air to their space. 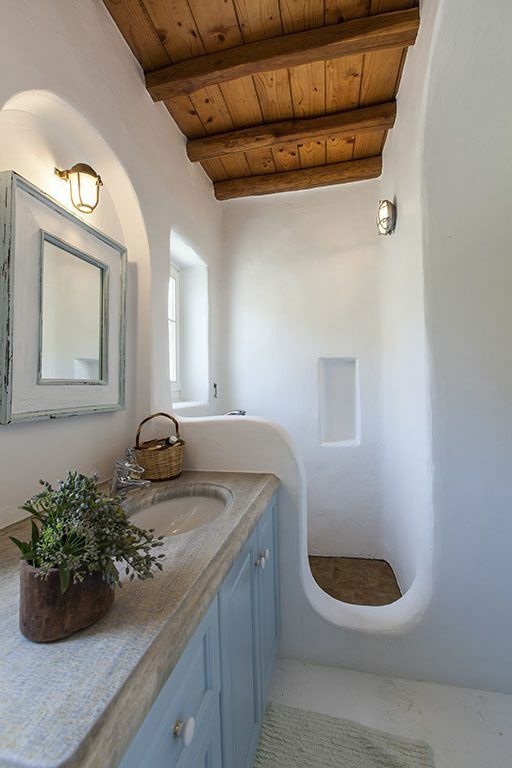 And in the bathroom, Greek can take a really interesting form with its white plaster on the entire bathroom and the curve and flowing lines. 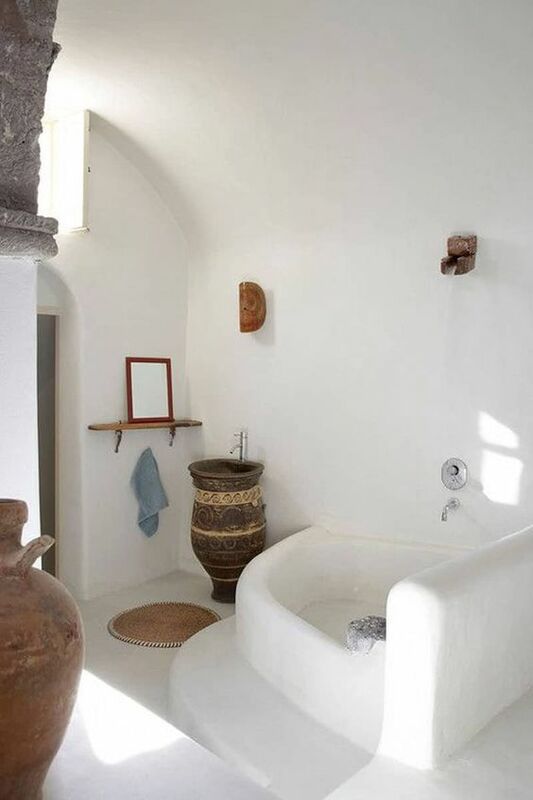 These below are ten exquisite Greek bathroom that you will fall in love with. The bathroom below shows the perfectly flowing line on the bathroom partition and floating vanity. The curvy sink and mirror with detailed frame helps to add some features. 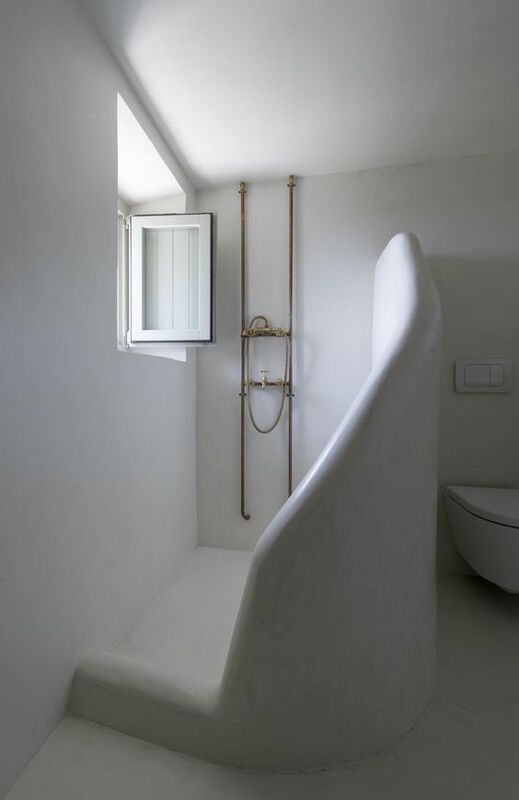 The flowing lines on the bathroom surely make the space sweet yet still neutral. This one here has a quite private curl but it is still an open bathroom. 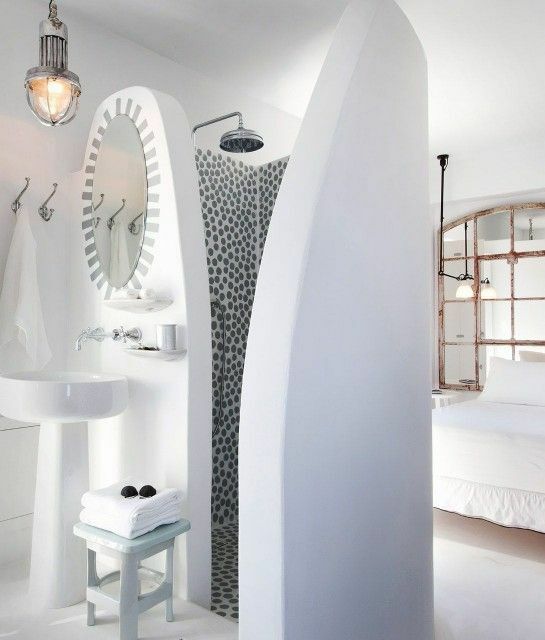 Using Greek approach on the plaster and minimalist look, this one here successfully becomes a pretty addition to the bedroom. In this one, the Greek influence is seen in the white plaster wall. 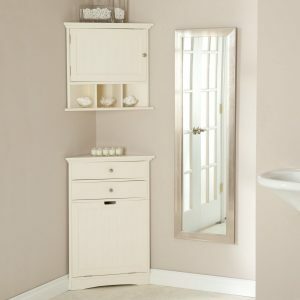 The half partition and the built-in vanity shows a great continuing lines and design. As Greek does not usually adds tiles, to avoid slips this one adds a textured floor in natural material of stone. In reliving Greek vibe, this one here has all that is needed in creating Greek look. 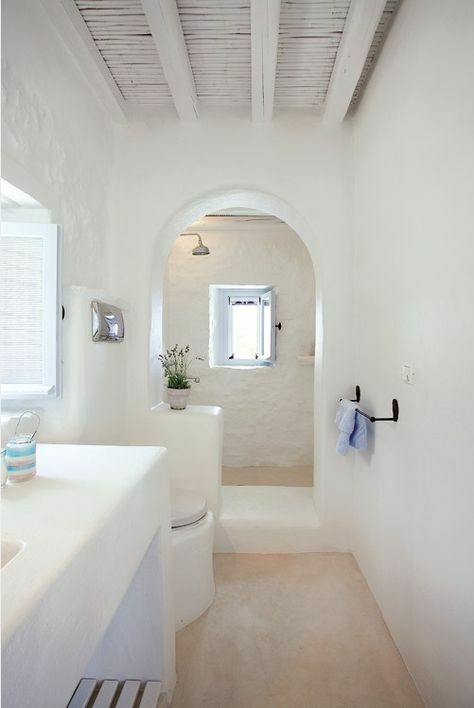 The white plastered wall and floor is beautifully seamless. The tall ceiling makes the room airy and spacious. 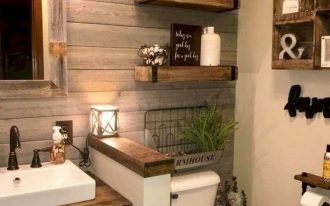 The natural wooden vanity on the side is just the right thing to be added. 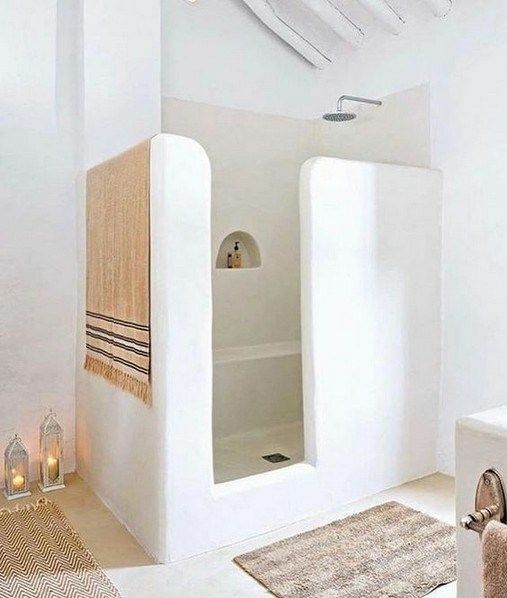 With the white plastered surface on the entire bathroom, this one here shows a simple details on the built-in bench and shelves inside the shower area. 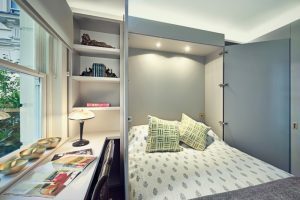 The partition is quite tall and simple with curvy corner. 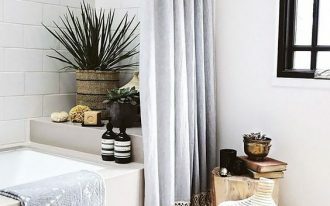 While the previous one looks so simple, this one here adds everything that modern bathroom usually has including the rattan basket under the white vanity, and the backsplash too. However, the influence of Greek style can be easily spot on. While the others have shower area, this one here prefers to have tub over shower. And it actually gives more spacious look in the bathroom. The white curvy space looks large that you can enjoy your bath perfectly well. 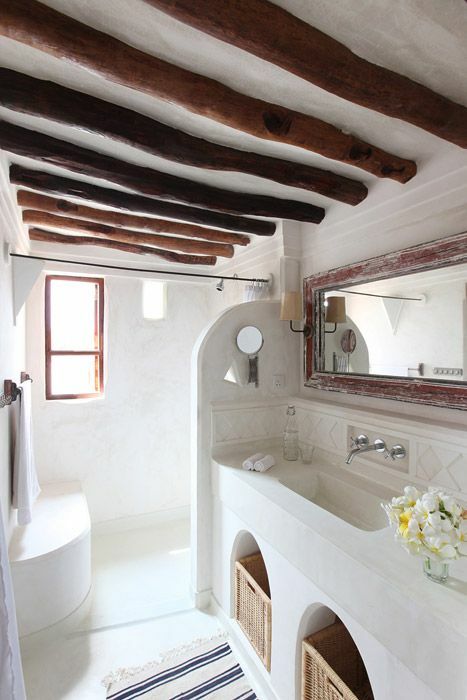 This bathroom here shows a beautiful glossy white plaster look on the bathroom that tries to give more details. The different level of height in the partition and the indented wall where the mirror is on make a simple yet interesting texture and layer while the stone floating sink adds a color to the white bathroom along with dark wooden framed mirror. 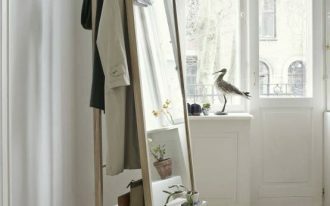 This long bathroom looks so comfortable to prepare yourself facing your day. It is a perfect place to relax at night too, maybe having some philosophical thoughts included. 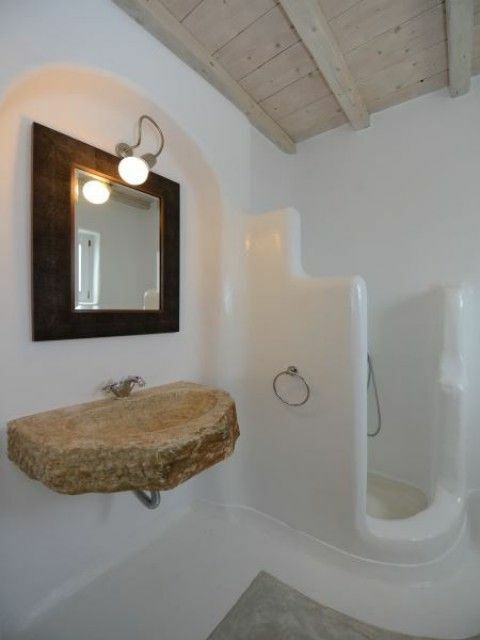 This one here is Greek bathroom in a small space. 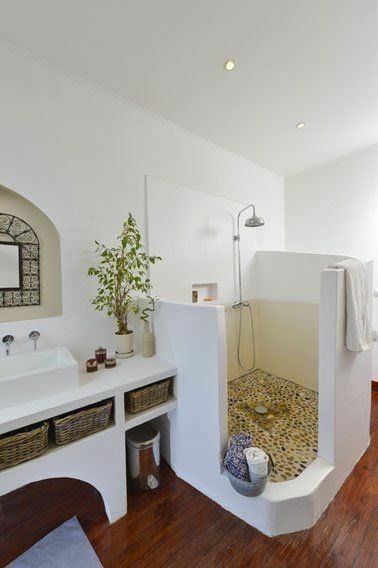 The sloping plaster partition separate the shower prettily with toilet on the other side of the partition.